Man Diesel & Turbo will deliver nine compressor trains to process accompanying gases at Kuwait Oil Company’s Gas Gathering Center 32. Man Diesel & Turbo has won an order to supply nine compressor trains to Kuwait Oil Company (KOC). 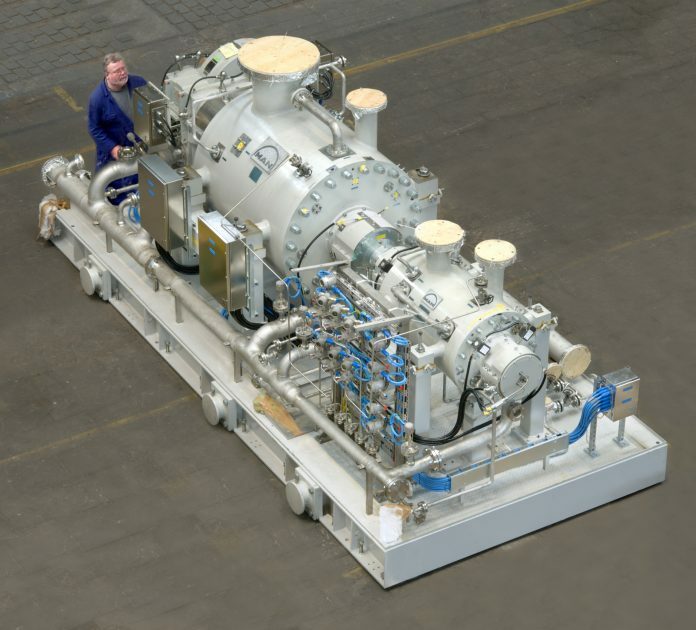 The nine electric-motor-driven compressors, type RB35 and RB28, will be utilized in KOC’s Gas Gathering Center 32 (GC 32) and will allow sour and wet gas from Kuwait’s Burgan field to be compressed. The order also includes an option for additional machines and services. Petrofac, an international oil and gas services provider, was awarded the US$1.3 billion engineering, procurement, and construction (EPC) contract for GC 32. The EPC project is the first sour gathering center to be developed in the field and will process crude oil and associated gas recovered from the Arifjan, Marat, Minagish Oolite, and Burgan Wara high hydrogen-sulfide fields. Scheduled to be completed in mid-2020, the scope of work for GC 32 includes greenfield activities with tie-in works to existing brownfield infrastructure, and will have the capacity to produce around 120,000 barrels of oil per day together with associated water, gas, and condensate.